Welcome to our first blog of our ‘Teacher Feature’ series where we give you a front row seat while we pick our Power Living teacher’s minds. To kick off the series we delve deep into none other than Troy Abraham’s personal yoga practice. Yogaholics: How and when did you first get into yoga? Yogaholics: How long did it take you to really get deep into the practice (past the asana)? Troy: Well… I left my first class feeling high, so I immediately noticed the mental benefits. The first year I practiced, I didn’t really know anything about studios/styles etc, but I knew I felt better when I moved and breathed consciously, so I just did my own 20 minute routine every night and every morning. But the real depth for me would’ve come when I did my first week of Teacher Training and realised the power and potential of the life implications of the practice, this would have been 3 years after my first class. Yogaholics: What is your daily personal yoga or general exercise routine? Troy: It’s variable. But most recently, I get down to the beach at 5:30am, do some joint mobility work, maybe a jog for 20 minutes, do some deep Pranayama, some animal flow and mixed movement exercises, then a little vinyasa flow to cap it all off before a swim in the sea! I’m pretty fortunate to live on the beach! Yogaholics: What are your three favourite yoga asanas? Yogaholics: What food (diet) do you typically follow? e.g. vegan, ayurvedic etc. Troy: I eat plant based, but I don’t mentally decide on any specific diet if my body is craving something else, or if I’m offered. I’ve found that often we can decide what we “should” be eating because it works well for someone else, but then we feel like we are punishing ourselves when have a craving for something else. My personal philosophy is that the energy we put into the food we are eating is crucial, so even if we are eating the cleanest, most sustainable food available, if we aren’t happy about it we are essentially putting negative energy into our body. I do my best to source food from responsible producers and growers and I like the Dalai Lama’s approach of eating what is offered. Yogaholics: If you weren’t a yoga teacher, what do you think you would be doing? Troy: I always wanted to be a mad scientist and musician. I love problem solving and making music, and it’s the only other places I could get away looking the way I do! Yogaholics: Words to live by? Troy: Everything is temporary. Accept, adapt, move on. 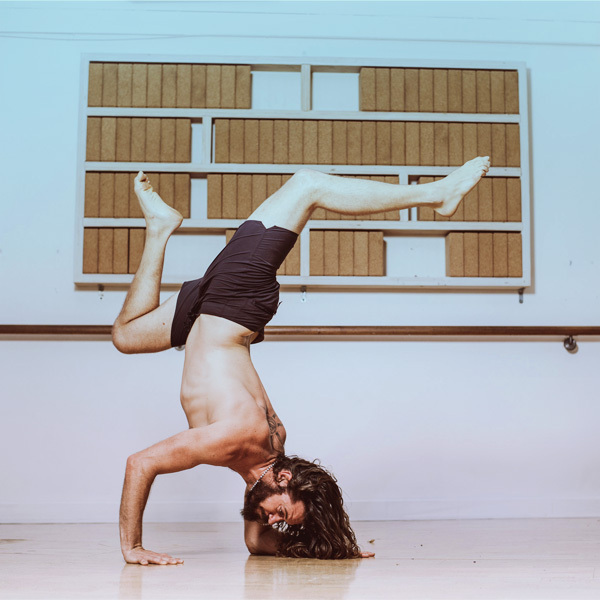 Join Troy in many of our Yogaholics videos and enjoy practicing with him at home or at the Power Living studios.